After a century suspended in stone, Cian would do anything to get his hands on the sorceress who put him there. Strangely, his dreams of revenge turn into an animal hunger to put his hands all over her-in every delightfully wicked way imaginable. As their attraction catches fire, Emma dreads what could happen when he learns the truth. If he will sacrifice her to break the spell . . . or fight for a love that goes beyond animal instinct. 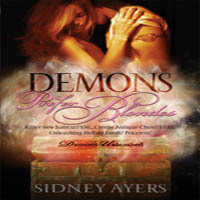 This is a paranormal romance series, so that means that each book focuses on the hero and how he finds his mate. I mentioned this in my review of the first book, Primal Hunger, but it’s worth mentioning again. I especially love it when the hero in a PNR book is a shifter or another paranormal type whose animal instincts take over when finding their mate. The whole “Mine” aspect of it. The whole “I’ll chase you but never doubt that I WILL catch you” aspect of it. The whole “I need to mark you with my teeth so the whole world knows who you belong to” aspect of it. It makes me all tingly just thinking about it. Well, this book was like the first book when it came to the ‘animal leading to capture his mate’ part and I was happy about that. I’m not sure why I like that so much. Maybe it’s because I want Jason to bite me and leave his mark on my neck for all to see…including my mother. And my father. Okay…maybe not. Cian, being that he was “asleep” for the past century, has a little catching up to do once he wakens. It’s cute how we see him trying to adapt. Some of the conversations he has with Emma made me giggle. I also enjoyed reading Emma. She is a sorceress who is lacking in the magic department. I found her to be strong even though she feels weak. And her friend and the whole twist with that!…didn’t see that one coming. That was pretty cool. The only thing that sort of bugged me while reading this was, as I understand why Emma wasn’t telling Cian that she’s not the one who actually cursed him, I don’t know why it took her so long to finally tell him. Or for him to figure it out on his own for that matter. It didn’t bother me enough that I was cursing the book and wanted to give up on it, I just found myself wondering a little more than I think I should have. In any novella, I always wish there was a little more information into the background of the main characters and into what makes them tick. I didn’t feel at a loss or anything while reading about Cian or Emma, I just wish there was a little more. But what I read did keep me interested. I liked reading about these two and I liked them together. If you’re wondering if I enjoyed this one more or less than the other books in the series…well, I’ve enjoyed them all pretty much equally. I find they are similarly well paced and well planned. I enjoy the family that is the center of this series and I like the world that’s been built. What I’m really looking forward to is book 4, Primal Temptation! At the end of Primal Pleasure, there’s a twist involving Briana…and now I MUST know what’s going on with that! But I have to wait, like the rest of the world, until Summer of 2011 to find out what’s up. “’So revenge is all that matters to you?’ She certainly hadn’t gotten that vibe when she’d touched his belongings and experienced his memories. ‘Not all that matters, no.’ He dragged his shirt over his head and tossed it behind him. Unfazed, he moved his hand to the fly of his jeans, drawing her attention down his toned abs – and how had she missed those on the roof? Share the post "Review: Primal Pleasure by Sydney Somers (Pendragon Gargoyles #3)"
I didn’t like this one as much as book 2 – but I still like her style of writing. Looking forward to more! I bought this one right after I finished book 2, but haven’t read it yet. Your review makes me want to fix that right now! Colette – Read it. It’s quick and a good continuation to the series. I really love your reviews on this series and I like that it’s a series of novellas instead of full length novels…the problem is I have so many books on my TBR list that it’s not even funny. But I do have the first book in this series on my TBR list and as soon as I get around to reading it I’ll be reading the rest of the season if I enjoy it as much as I do believe I will. Really enjoying your reviews on this series! Really thinking about picking them up at some point this year lol!